Can you ELIMINATE Tennis Elbow Pain in just 28 days? Is it starting to impact your life? Are you unable to sleep because of the pain? Do you have trouble doing everyday things, like picking up a coffee mug? Or your kids, or grandkids? Do you have trouble doing your job? 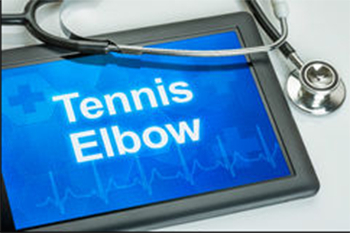 Have you tried anything to heal your Tennis Elbow? If you haven’t had any luck yet, I’d like to share something new with you. The gentle, easy exercise routine many of my clients have used to heal their Tennis Elbow pain, once and for all, in just 15 minutes a day! If you join the Challenge and you don’t get those results, I will give you DOUBLE your money back. 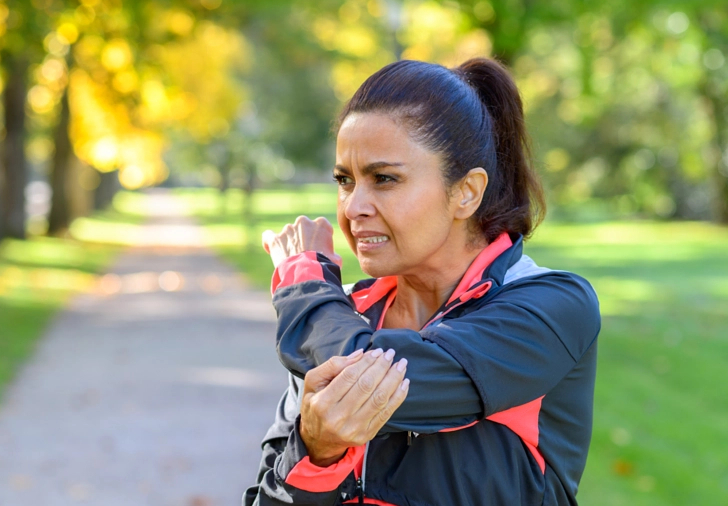 NOW… before I tell you more about the 28-Day Challenge, let me tell you about the simple exercise routine we’re going to use in the Challenge to reduce and eliminate your Tennis Elbow pain. EFFECTIVE - This solution completely eliminated many of my clients’ Tennis Elbow pain, in just 15 minutes a day. BASED ON REAL SCIENTIFIC RESEARCH - I’ve been a Kinesiologist and leading pain and injury specialist for 24 years, and I’ve learned that pain-relief and injury-recovery programs that are based on conclusions from real scientific studies produce better results for most people. 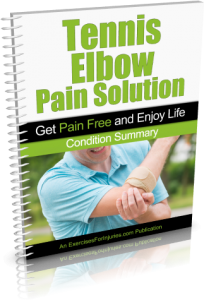 The Tennis Elbow pain solution I’m going to show you on this page is based on conclusions from 22 different scientific research papers and studies (all of which are listed below for your reference). 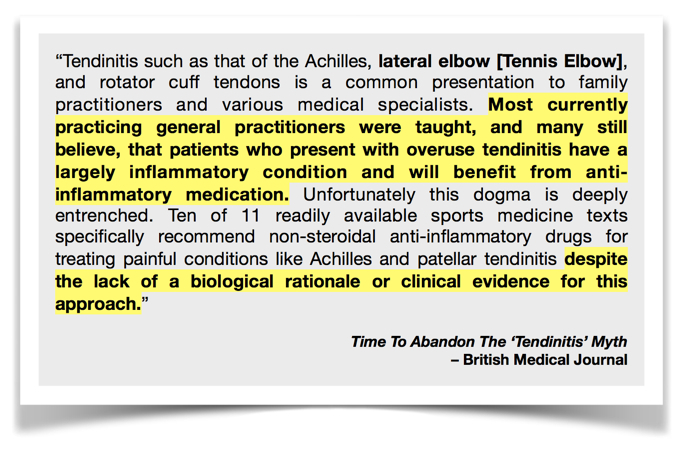 REALISTIC - There are more gimmicks, instant fixes, and “5-minute miracle cures” available today for Tennis Elbow pain than ever before. I KNOW, from 24 years of working with people with Tennis Elbow, that there is no such thing as a “miracle cure.” My solution takes some time and work on your part, but the reward is: it actually works! NATURAL - You won’t need injections, pain-killers, surgery, wraps, braces, devices, or strenuous workout regimes. The solution I’m going to show you is completely natural. EASY & GENTLE - Virtually anyone can use this solution. You can do it if you’re 25, 35, 45, 55, 65, 75, or older. You can do it even if you’ve never exercised a day in your life. You can use this solution if you’re not in shape… even if your body doesn’t feel flexible at all. FAST - This solution only takes 15 minutes (or less) each day to do. The Tennis Elbow solution I’m going to show you on this page is different than others because it is based on real scientific research. 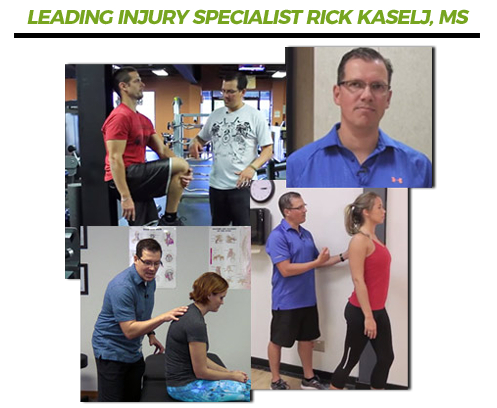 My name is Rick Kaselj and I’m a Kinesiologist and pain and injury expert. I’ve been helping people heal their injuries and reduce and eliminate their pain for over 24 years. Whenever I create a recovery program for any injury, I rely heavily on published medical and scientific research. ...but what is surprising is the number of programs, treatments, gadgets and devices that are available today, that are based not on research, but on guesses, hunches, misinterpretations, and pseudoscience. 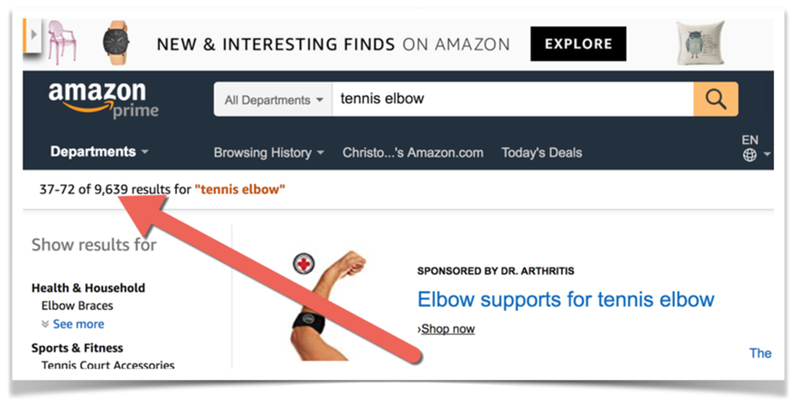 By any chance, have you been to Amazon.com to find a solution for your Tennis Elbow? Amazon.com has 9,639 products and books for Tennis Elbow! Those reviews are for the same product! One person said the product cured their Tennis Elbow, and the other person said the very same product actually made it worse! CONFUSED YET? Let's head on over to YouTube! Cure your Tennis Elbow by throwing rocks??? My clients sometimes ask me what I think of these types of “amazing,” “miracle,” “5-minute” cure videos for injuries. ...in spite of the fact that the medical community has agreed that Tennis Elbow is not caused by inflammation. And this study (https://www.ncbi.nlm.nih.gov/pubmed/16371498) was a controlled clinical pilot trial to determine whether icing decreases pain and helps to heal Tennis Elbow. The study had two groups of people with Tennis Elbow. The control group did exercises only. The test group did the same exercises and iced. Both groups showed the same amount of improvement, showing that icing provided no real benefit for Tennis Elbow. So then, how DO you cure Tennis Elbow? With chronic pain and injuries, no solution works for everyone, all the time. That’s just reality, and if anyone tells you otherwise, you should be very skeptical. HOWEVER... as I mentioned above, what I’ve seen in my 24 years of helping people overcome injuries and eliminate pain is that the programs and methods that are based on real scientific research work better and faster for most people. this much real scientific research? 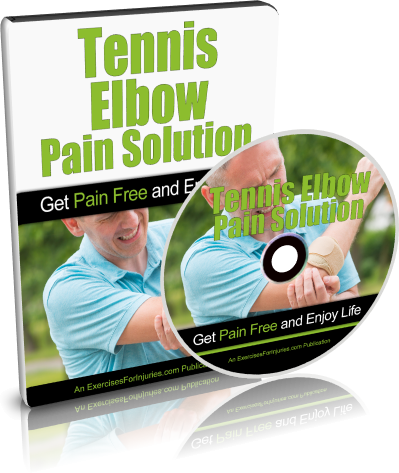 It’s called Tennis Elbow Pain Solution and it’s a video exercise program that you can do at home, completely on your own. It’s designed to lengthen, strengthen and heal the muscles and tendons near your elbows, and stabilize and strengthen your shoulder and scapular muscles, all so you can heal your Tennis Elbow Pain and prevent it from occurring again in the future. I want you to get back to your life the way it was before Tennis Elbow. That’s what this program is all about. Get back to work. Get back to sleeping through the night. Get back to playing with your kids and grandkids. 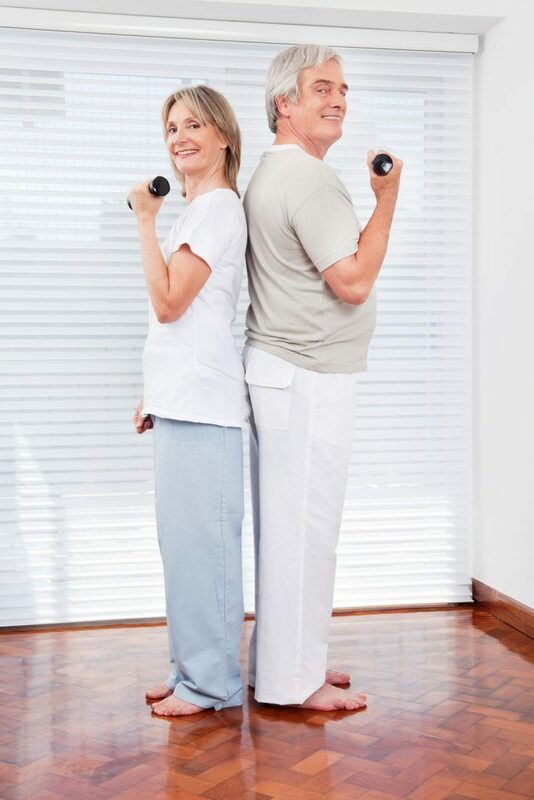 Get back to your hobbies and sports, and a pain-free, active, enjoyable life! 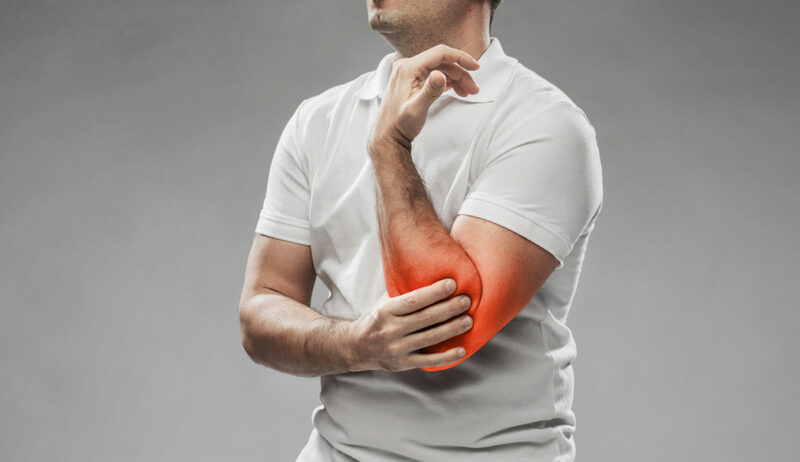 In this 28-Day Challenge, I’m going to work with a small group of 50 people (the first 50 who sign up), and we’re going to use my Tennis Elbow Pain Solution program. My goal is to get you significant pain relief within 7 days, and then completely eliminate your Tennis Elbow pain by day 28! ...that I will give you DOUBLE your money back if that doesn’t happen within 28 days! If you aren’t totally ecstatic about the results you have at the end of the 28-Day Challenge, just email my team at support@ExercisesForInjuries.com or call us at (888) 291-2430 within 60 days from the date of purchase, and we will send you double your money back - $56! Your Tennis Elbow pain is ENTIRELY gone… it’s a thing of the past. You can do simple, day-to-day activities again with ease, like lifting your coffee cup, blow drying your hair, etc. No more worrying about your elbows or arms. No more wondering if the pain will get worse. You’re playing with your kids (or grandkids) again, running in the park, lifting weights, working out… all without a care or worry. This has already happened for many of my clients. In the “Tennis Elbow Pain Solution 28-Day Challenge,” we’ll be using my Tennis Elbow Pain Solution program over a specially structured 28-day period. Why does this system and 28-Day Challenge work so well to help people reduce and eliminate their Tennis Elbow pain? Because it’s based on real scientific research, and because it’s comprehensive and easy. ...because it includes 5 different approaches to healing and strengthening the muscles and tendons near your elbow, and your shoulder and scapular muscles, so no stone is left unturned! Because we attack the problem from so many different angles, and with so many different approaches, your Tennis Elbow pain has nowhere to hide, and can’t survive! Self-massage is an easy way to quickly decrease tension and increase blood flow to the muscles and tendons near your elbow. Decreasing the tension allows the muscles and tendons to heal, and increasing blood circulation removes metabolites and brings in new blood to aid in healing. In the program, I’m going to teach you several different self-massage techniques that you can do in minutes, with just your hand or regular household items. Static stretching is holding a joint or muscle in a static or still position for a short period of time. The static stretches we’ll do in the program are gentle and easy, but are effective for lengthening and strengthening the muscles and tendons at the lateral epicondyle. These static stretches will make the muscles and tendons more resilient and less prone to the microtraumas (tiny tears) that cause Tennis Elbow. Isometric strengthening uses a special type of contraction that stretches additional fibres in the muscles. 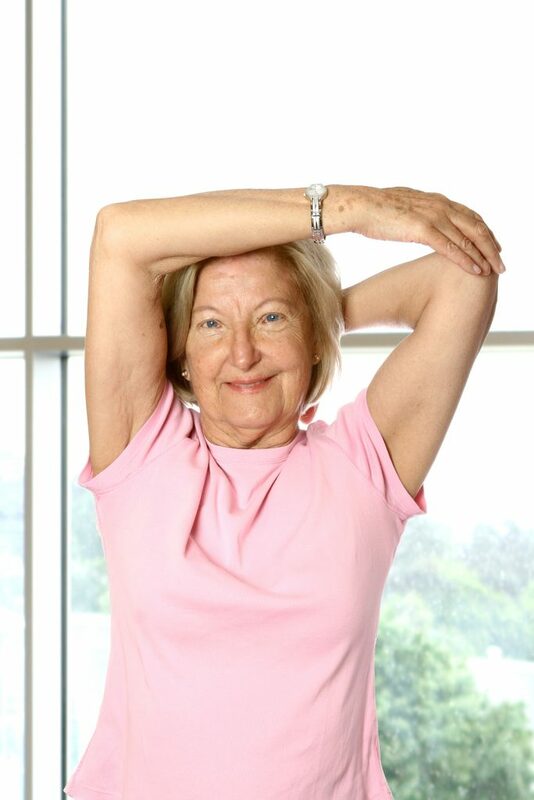 Isometric stretches and exercises are gentle, safe movements, but are highly-effective for strengthening your extensors (forearm muscles), which is a key component in healing and preventing Tennis Elbow. Eccentric strengthening exercises produce collagen to help strengthen the muscles and tendons near your elbow. Several studies have found eccentric strengthening to be highly-effective for healing Tennis Elbow. One study conducted in 2005 found that in the long-term, 71% of the people using eccentric strengthening had completely recovered from Tennis Elbow, as compared to only 39% that didn’t do eccentric strengthening and did only stretching (Martinez-Silvestrini 2005). Many people (and health professionals) don’t realize it, but weak shoulder and scapular muscles can be a significant contributing factor to Tennis Elbow, because the elbows and wrists must be recruited to handle the more taxing, repetitive movements the shoulder and scapular muscles should be handling, but aren’t able to. When we strengthen our shoulder and scapular muscles, it takes a lot of the load off of the elbows and wrists, thereby decreasing the strain and stress on them, which is what causes Tennis Elbow! make sure I get one of the 50 spots! 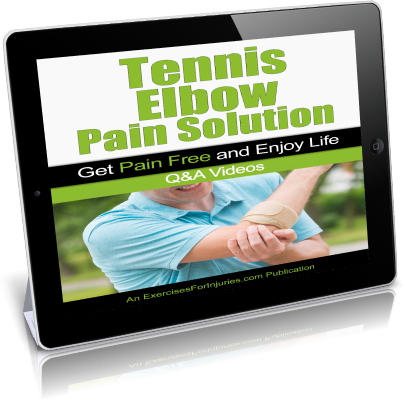 Get INSTANT ONLINE ACCESS to the Tennis Elbow Pain Solution 28-Day Challenge. INSTANT ONLINE ACCESS to the whole program! In this special 28-Day Challenge, you will get direct access and interaction with me, personally. Because of this, I need to limit the size of the group, so I can make sure everyone is served to the best of my ability. I will have another Tennis Elbow Pain Challenge at some point, but right now, I’m not sure when. This is not just a bunch of exercises thrown together with the HOPE that they will relieve your pain. This is a CAREFULLY DESIGNED SYSTEM that has already helped many of my clients decrease and eliminate their Tennis Elbow pain. UNLIKE MOST OTHER Tennis Elbow treatments and methods, this program is based on 22 different medical papers and scientific studies that are specifically related to Tennis Elbow. In my 24 years as a Kinesiologist and pain and injury specialist, I’ve seen that the programs that are based on the conclusions of real medical and scientific research just work better than those that aren’t. This program doesn’t require you to make any big changes in your lifestyle - all you have to do is 15 minutes of light exercises and stretches each day. You can do this exercise program by yourself, pretty much anywhere, pretty much anytime, with just your body and a few household items you can get at any hardware store, or online. You will know EXACTLY how many reps to do. You will know EXACTLY how many sets to do. You will know EXACTLY what intensity you should do each exercise with. You will know EXACTLY how your body should feel when you do each exercise correctly. Nothing will be left out – you will have no guesswork or confusion about what to do. Everything in this program is systematized and laid out clearly for you. Below is a description of exactly what each component of the program is and how each helps get you to your end goal >>> FAST REDUCTION AND ELIMINATION OF YOUR TENNIS ELBOW PAIN, so you can get back to your life as it was BEFORE this! It’s very important, before you get started, to assess your current condition. This is the first thing I do every time I see a new client with Tennis Elbow pain. We need to understand how much pain you’re experiencing now, how serious your injury is, and what range of motion you can currently handle. Having this information will prevent further injury, and help you get the best possible results, in the shortest amount of time. When you join the “Tennis Elbow Pain Solution 28-Day Challenge,” I want you to come up to speed FAST on what you need to know, so you can get started FAST, and start reducing your pain FAST! So, I’ve distilled the educational content of the program down to the most important summary points you need to know. 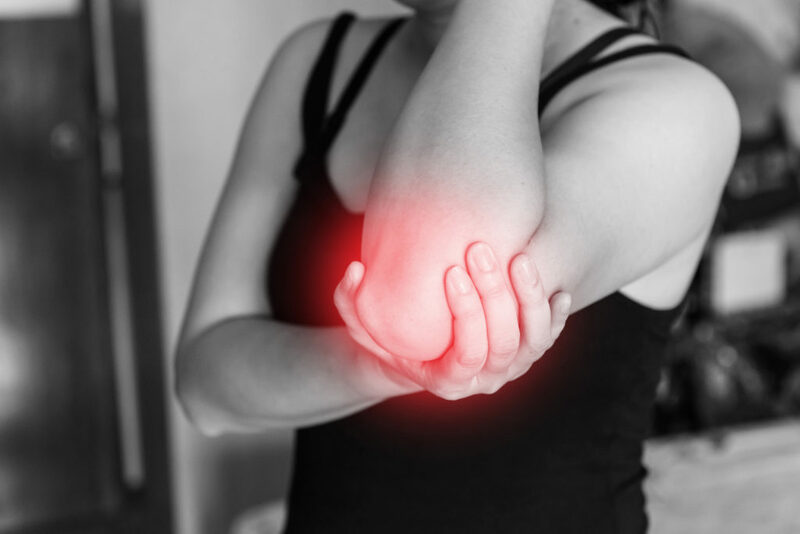 In this Quick-Start Cheat Sheet, I explain, in plain English, what causes Tennis Elbow pain, what the common symptoms are, which activities make it worse, and some important tips for healing it fast. 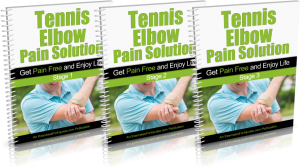 The “Tennis Elbow Pain Solution 28-Day Challenge” is a comprehensive program of gentle, yet highly-effective stretches and exercises designed to reduce and eliminate your Tennis Elbow pain, and get you back to a pain-free life. First… don’t be scared or overwhelmed by the fact that this exercise program has 3 stages. If you follow the instructions and do just the Stage 1 sequence, which will only take 15 minutes each day, you should feel a significant reduction of your Tennis Elbow pain within 7 days. BUT… I want to help you COMPLETELY eliminate your Tennis Elbow pain, and I’m giving you a comprehensive 3-stage exercise program to make sure you have everything you need to do that. This is because, in order to get the best possible results, in the shortest period of time, it is critical that you learn to do these stretches and exercises the right way, in the right sequence, with the right amount of intensity, and for the right length of time. Most video exercise programs leave out these kinds of details, and this leaves you unsure about exactly what to do, and exactly how to do it. This causes confusion, and might leave you discouraged, and you may decide not to continue with the program, which means you’ll definitely not get the results you want. ...so you can do it consistently, until your Tennis Elbow pain is healed for good. 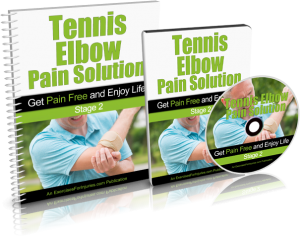 As mentioned above, for each of the 3 stages in the “Tennis Elbow Pain Solution 28-Day Challenge,” you get an instructional video, a follow-along video, and a comprehensive manual. During the “Tennis Elbow Pain Solution 28-Day Challenge,” you’ll have the opportunity to submit any questions you have, directly to me. At the end of each week during the program, I’ll give you access to a video with my answers to all your specific questions, and those from other participants in the program. 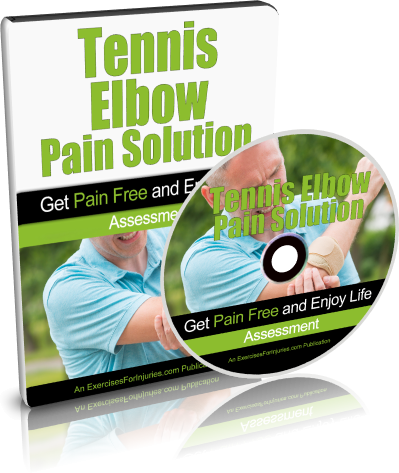 I’m going to answer all of your specific questions personally… because I want to make sure you stay on track with this program, and definitely achieve your goal >>>>> END your Tennis Elbow pain for good! I am including another way for you to get direct access to me - for getting your questions answered, and also for inspiration, motivation and accountability. 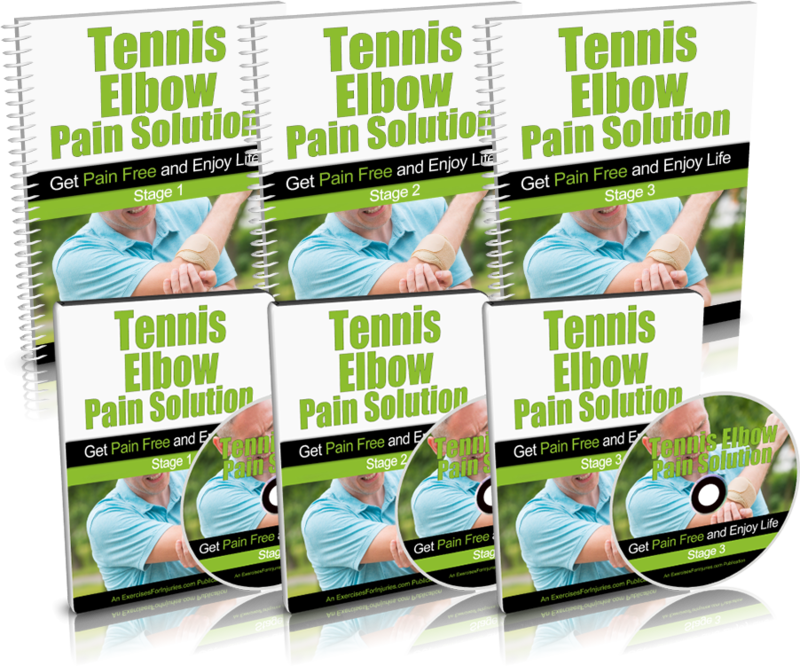 During the “Tennis Elbow Pain Solution 28-Day Challenge,” you will get exclusive access to the Exercises For Injuries private, secret Facebook group. In this group, you get the opportunity to ask your questions, about your specific situation, to me and my team of health and fitness experts, DIRECTLY. You also get to see the answers we give to other members of the “Tennis Elbow Pain Solution 28-Day Challenge” - these can be surprisingly helpful even though you didn’t ask the questions. You also get the chance to meet new friends and become part of a supportive community. Most of the people in my VIP Coaching Group have told me, at one point or another, that they get incredible support, inspiration, motivation and accountability - not only from me and my team of experts, but also from the other members in our group. We attract a very good bunch of people in this group, which we love! No problem. You don’t have to join a gym, or buy any equipment to do this program. All you need is your body and a few household items you can buy at any hardware store, or online. No problem. I designed this program so you could complete it in 15 minutes or less every day. This, combined with the fact that you don’t need a gym or any equipment, might make this the most convenient exercise program ever! Perfect. This program is low-impact, so it’s safe for just about everyone, and it’s intentionally gradual, meaning you start out very slowly, and increase intensity and duration gradually. Most of my clients don’t want that either, which is why the duration and intensity of this program (which you can easily adjust if you choose to) are designed not to exhaust you, but give you a good workout that gets results, without making you want to take a nap one hour later. I hear this all the time. This program works with a gradual progress approach. We start you out very slowly, and increase intensity and duration gradually, so you never feel overwhelmed or too far outside your comfort zone. And, if things are too easy and slow for you at any point, we also show you how you can adjust and increase the progress yourself. You save money. You won’t need expensive therapy appointments, training sessions, courses or seminars. These videos alone will decrease and eliminate your elbow pain, and they're very affordable! During the 28-Day Challenge, submit any questions you have, and at the end of each week, you’ll get access to a video with Rick Kaselj’s answers to all your specific questions, and those from other participants in the program. Throughout the “Tennis Elbow Pain Solution 28-Day Challenge,” you’ll get access to exclusive Tennis Elbow pain video webinar trainings that Rick Kaselj will be doing. Anytime this program is updated, you will receive a free copy of the new version. I’ve sold this same program as a standalone product in the past for $97, and that didn’t even include all the direct access to me, and all the extra goodies that come with this 28-Day Challenge. There are other challenges out there that provide access, like I do here, but they cost $2,000, even $3,000! You’re not going to pay anything close to that, because I want this program to be available to as many people with Tennis Elbow pain as possible. It’s a shame for anyone with Tennis Elbow pain to go on suffering with it, when my program could help remove it for good. I know it sounds cheesy, but I would give this program away for free if I could. ...but you still aren’t going to pay anything close to $3,000, or $2,000. You won’t even pay the $97 I charge for this program when it’s sold as a standalone product. 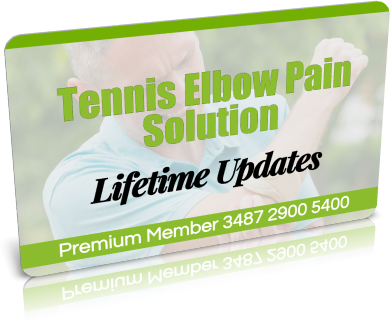 Today, you can get everything in the Tennis Elbow Pain Solution 28-Day Challenge for just one payment of $28. I’ve decided to limit this 28-Day Challenge to just 50 people. Because there is a lot of access and interaction with me, I need to limit the size of the group, so I can make sure everyone is served to the best of my ability. I will have another Challenge at some point, but right now, I’m not sure when. So if you’re interested in this, sign up now… because these 50 spots WILL DEFINITELY FILL UP. We’re in the process of sending out emails to over 100,000 people who are subscribed to our e-newsletters, and we’re inviting all of them to join this Challenge. this program fills up in one day! Yep - you read that right. If you don’t get the results you want from the “Tennis Elbow Pain Solution 28-Day Challenge,” you will get DOUBLE your money back. And you have 60 days from the start of the 28-Day Challenge to decide. This means that after you’ve finished the whole 28-Day Challenge, you’ll still have another 32 days to decide whether you’d like a refund or not. I want you to know that you have no risk, so you can join this program and do it with peace of mind. I want you to be focused on learning and doing the easy, gentle exercises and stretches in this program so you can be free of your pain. I don’t want you to have to worry about whether it’s going to work, or whether you’re going to lose out, or anything like that. With my 60-day, 200% money-back guarantee, you can put your mind at ease and just focus on doing the program and getting better. If, for any reason, at any time within 60 days from the date of purchase of the “Tennis Elbow Pain Solution 28-Day Challenge,” you aren’t completely thrilled with the results you got, just call or email my team, and we’ll promptly return DOUBLE your money - $56. Hi, my name is Rick Kaselj and I’d like to tell you a little bit about me, so you can feel comfortable that the program and 28-Day Challenge you’re considering comes from a credible authority, with expert-level training and experience. If you do nothing different... in 30 days, you’ll probably still have miserable Tennis Elbow pain. And you’ll probably still be unable to play sports, do your hobbies, and pick up your kids or grandkids. 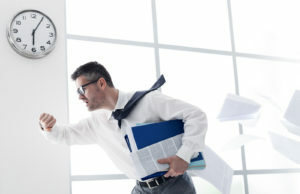 You might still have trouble sleeping through the night, and even doing your job. If you TRY my “Tennis Elbow Pain Solution 28-Day Challenge,” with absolutely no risk (it comes with an unconditional, 60-day, 200% money-back guarantee), I am 98% sure that in just 28 days, you will see some VERY DIFFERENT results, and you will be feeling A LOT BETTER. ...to see if my program and this 28-Day Challenge can REDUCE OR EVEN ELIMINATE YOUR Tennis Elbow pain? What if you ACTUALLY were free of all your pain, and back to your life and your favorite activities… just 28 days from now? If you don’t get significant pain reduction in the first 7 days AND complete elimination of your Tennis Elbow pain by Day 28, you get DOUBLE your money back! If you don’t get the results you want from the the “Tennis Elbow Pain Solution 28-Day Challenge,” you will get DOUBLE your money back. And, you have 60 days from the start of the 28-Day Challenge to decide. This means that after you’ve finished the whole 28-Day Challenge, you’ll still have another 32 days to decide whether you’d like a refund or not. And who is it NOT for? You can do this 28-Day Challenge if you’re 26, 36, 46, 56, 66, 76 or older. You can do this 28-Day Challenge if you’ve never exercised a day in your life. You can do this 28-Day Challenge if you have mild pain or severe pain. You can do this 28-Day Challenge if you’re out of shape. You can do this 28-Day Challenge if your body doesn’t feel flexible. You can do this 28-Day Challenge if you have a very busy schedule - the whole routine takes only 15 minutes (or less) each day. You can do this 28-Day Challenge if you have irregular working hours or an unusual job - these simple and easy stretches can be done before work or after work. You can do this 28-Day Challenge if you hate working out and exercising, because these easy, gentle stretches aren’t really even a workout. You’ll never even break a sweat doing this program. The only person this 28-Day Challenge is NOT for, is someone looking for an instant fix or 5-minute miracle cure. There is no such thing as an instant fix or 5-minute miracle cure for Tennis Elbow pain. This program takes some work on your part and takes some time to get the results you want, but the good news is: it doesn’t take very long. Do I have to go anywhere special to be part of the “Tennis Elbow Pain Solution 28-Day Challenge”? No – this is a virtual challenge, which means you can do it from the comfort of your own home. This “challenge” is different from other programs because you will have lots of direct access to me, and get lots of personal attention from me, but it can still all be done from the comfort of your own home, over the Internet. Because I will be personally involved in helping you reduce and eliminate your Tennis Elbow pain, I am limiting the group size to 50 people, so I can be sure to serve each and every person to the best of my ability. Click here to get one of the 50 spots, before they fill up. I was surfing around the Internet and found a bunch of exercises for Tennis Elbow pain. Will these help? You can definitely find exercises for Tennis Elbow online. But you won’t find a complete program designed to heal and strengthen the muscles near the elbows, the muscles in the forearm, and the shoulder and scapular muscles, all of which support the elbows and wrists, and can contribute to Tennis Elbow. You won’t find a complete program that has been carefully crafted, based on scientific research and real-world testing, that includes ONLY the necessary exercises, with instructions on how to do them in just the right sequence, with the right number of reps and sets. That’s exactly what the “Tennis Elbow Pain Solution 28-Day Challenge” is. Each exercise session in this program is designed to take 15 minutes or less to complete. It may take a little longer in the beginning as you’re learning the stretches and movements, but you’ll have it down to 15 minutes or less in no time because these sequences are easy to learn. Yes, and no. Most fitness and health professionals take a shotgun approach to exercises for injuries. They keep giving you more and more exercises, hoping they will help. I don’t do that. My program only includes the exercises you need. I also recommend you do them in a specific sequence and I give you precise instructions on how many repetitions and sets you need to do. My program has been carefully designed, based on scientific research and real-world testing, and it is a SYSTEM that has already worked for other people. There will be no guesswork or confusion on your part – everything is laid out and easy for you to follow. My best advice for you is to stop all of the other exercises you are doing, and focus only on the “Tennis Elbow Pain Solution 28-Day Challenge” for at least the next 28 days. How long does it take to get my DVDs? There are no DVDs – we won’t be sending you anything in the mail. This is a digital video product, which means you can access everything online at our secure download web page. 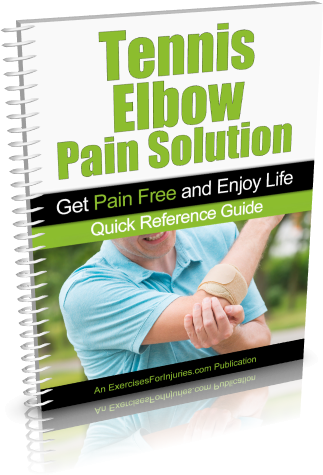 You get access to this download web page and everything in the “Tennis Elbow Pain Solution 28-Day Challenge” (all the videos, manuals, cheat sheets, and trackers) immediately after you order. You can immediately download everything onto your computer and get started right away. You don’t need to wait for anything in the mail. A brief overview of Tennis Elbow pain. You’ll learn what causes it, what the common symptoms are, which activities make it worse, and some important tips for healing it fast. Submit your questions during the 28-Day Challenge and Rick Kaselj will create weekly videos answering your specific questions and those from others. 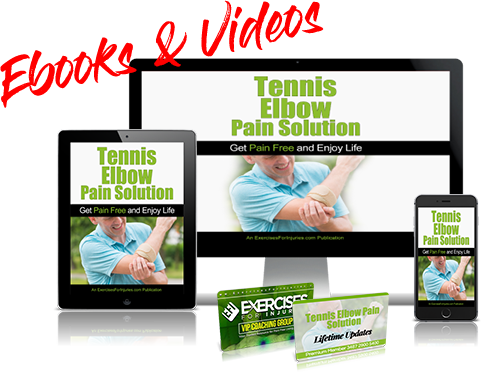 NOTE: The “Tennis Elbow Pain Solution 28-Day Challenge” includes a set of 11 downloadable videos, and 12 PDF files. No physical products will be shipped. After you order, you will get INSTANT ACCESS to download the videos and PDF files. The PDF files can be viewed on Mac or PC. The video format is M4V which can be viewed on Mac or PC. If you have any questions or need help, you can contact us at support@ExercisesForInjuries.com.